Any good TOEFL practice test should have the same sections, tasks and time limits as the real TOEFL test. If you have the money, you can order a practice pack online from the TOEFL website. These practice packs have a good set of exercises that are very close to the real TOEFL test situation. To take your practice sessions one step farther, you can use a TOEFL practice test service like ScoreNexus, which will let you take full practice tests, receive precise grades from professional educators and get personalized advice for improvement. It’s always a great investment to get feedback from knowledgeable TOEFL graders. But textbooks, classes and the test itself all cost a lot of money already. You also might be taking the TOEFL test to go study or work abroad, so you probably want to save as much money as you can. The solution: Make your own practice test! With Internet and technology, you can practice all test sections effectively by yourself—for free. And there’s another good reason to create your own test: Only you know about your strengths and weaknesses in English. Sure, your own practice test may not be perfect, but you can make it very effective by focusing on sections where you need the most work. Your own test is your friend! To start, remember that TOEFL has four sections you will need to include: reading, listening, speaking and writing. A good practice test will have exercises and questions for each section. *The time limit range for reading and listening depends on the number of questions. You will see the time limit clearly shown for every section on the test when you take the actual TOEFL. To get an idea of the type of questions you will see during the TOEFL test, download the free sample of questions and the interactive sample available at the official TOEFL website. Let’s now talk about each section, one by one. Reading is the first section on the test. You will have 3 or 4 passages of 6-8 paragraphs each, followed by a set of 14 questions per passage. Questions will focus on your understanding of the passage, its ideas, vocabulary and specific context meaning. You will have about 20 minutes per passage (to read and answer the questions). What does this mean for our practice test? First of all, you will need to find some texts to read! Passages from textbooks, scientific articles and even scholarly work are perfect for this. The best place to get them is Google Scholar, which searches the web for academic work based on keywords you provide—with links to actual articles, not just their descriptions! For example, type in “what is love” and you will get some interesting results. You can use abstracts (summaries of long academic papers) as your TOEFL practice passages if they are long enough (some can be! ), or use the introductions of the articles themselves. Just don’t use keywords that are too difficult or complex. You need a text that is written in academic style, but that you can still understand without being a science expert. So you have found your passages, now it is time for the questions (14 per passage). Because your practice test is homemade, skip the multiple choice format and make them open-ended questions instead. These are harder, and harder is better when you are preparing. Choose a sentence in the text and identify its purpose in the paragraph it is a part of. Pick a word that is unfamiliar or barely familiar to you and find its synonym or closest meaning. Pick a paragraph from the middle of the passage and summarize it in one sentence. Make up 11 more questions with similar tasks to these, and then you’ll have one reading section practice part. Bonus: Because the questions are open-ended, you will have to answer them in writing. That’s great practice for your writing section! Remember that since you are creating all the questions yourself, you have a big advantage because you can make them as challenging as you want. Really work on the areas the reading section is testing: paragraph and vocabulary comprehension, summarizing information and inferring meaning. Listening is fun to practice, even though you need to focus. The listening section involves listening to a set of conversations, discussions and lectures, each followed by several questions. There are usually six listening passages, most of them lectures (academic talks), not dialogues (conversations). Academic talks have 6 related questions, while dialogues will have 5 related questions. You will have just one opportunity to listen to the recording. You have to answer questions in order (no skipping or going back), so this is a tough one. You are allowed to take notes while you are listening, though, and the notes are not scored. With your homemade practice test, you will not be able to create the same exact set-up as the TOEFL test has. It’s better to focus on improving your listening, and learning how to take helpful notes. It really is the best practice to listen, listen, listen. For the dialogue-type recordings, which are more casual, search for clips on YouTube or watch excerpts from TV shows and movies (especially those that take place on university campuses). For the more difficult academic talks and lectures, the Internet is again your best friend. There are many online lectures and whole courses available in any subject. A particular favorite of many learners is the collection of free lectures from Stanford University on iTunes. Pick those that interest and challenge you. Don’t focus too much on your future field of study, because the TOEFL test won’t! You may get topics from physical sciences, social sciences, arts and life sciences on the test. Define a main idea or topic of the recording you heard. State a fact that is directly mentioned. Identify the reason the conversation is happening. Answer “why” or “how” questions relating to the conversation or lecture. Tell what can be inferred (understood) from the talk or the dialogue. (This is usually not stated directly in the audio, but can be understood from the emotion or tone of voice—so focus on those too). The “inference” and “imply” questions are the most difficult. On the test, they will usually have the option of “listening again,” which means that you will hear a small part of the recording one more time. Listening is hard! When you have all lectures and audio materials for practice, focus on the meaning of speeches, vocabulary usage and emotions of the speakers. Always try to imagine the consequences (results) of the audio clip you hear. Use your imagination and remember to take notes. Do not limit yourself to listening only to North American accents. Since 2013, the TOEFL test includes some lectures and conversations with speakers from the United Kingdom, New Zealand or Australia. These will still be standard, proper English, but you need to make sure you are comfortable understanding them. The TOEFL test’s speaking section is interesting, because it was introduced to the test in 2007. Speaking is hard enough for English learners, but TOEFL makes it even harder: You’ll have to talk to a microphone instead of a real person. This means no help from another person, just 45 seconds to submit an answer. But don’t worry! Practicing speaking at home is the best way to prepare for the TOEFL speaking test. There are two types of speaking questions on TOEFL: independent speaking and integrated speaking. Independent speaking refers to a general topic you’ll be asked to discuss or offer an opinion on. Integrated speaking involves first reading a short passage, which you’ll then refer to in your spoken response. Since you know your weaknesses, you’ll know which one is more difficult for you. Is it more difficult to come up with an answer on a random topic (and fast)? Or is it harder for you to discuss an existing piece of text? For integrated speaking, choose an academic text or lecture (you can use one from the reading section). Think about topics you could discuss based on the text. Do you disagree with the lecturer? Do you have alternative ideas? Do you want to elaborate on the contents? Once you have your speaking topics, choose one randomly during your practice test and start talking! Use a recording program (a built-in microphone on your laptop will do). Time your preparation time (15-30 seconds) and your response time (45-60 seconds). Notice the speed of your speaking. It is normal to talk faster in stressful situations, so practice controlling your speech and not speeding up. Play back your answer afterwards and listen for your mistakes. You may not like the sound of your own voice, but trust me—it’s all right! Your accent is truly not as horrible as you think, and listening to yourself is so helpful for improving in this section. You are not expected to give a perfect response. You also won’t be scored on your opinion, just on the way you present it. It’s all about clear communication. The goal of practicing speaking is not only to give good and clear responses, but to also be comfortable speaking into a microphone. So even if you are not recording yourself, pretend you are holding a microphone! This section is scary for many English learners, because it needs all of your English skills at once. You get a topic to write about, and then you have to write a structured set of paragraphs to discuss that topic. The TOEFL test’s writing section includes two categories of tasks: independent writing and integrated writing. Independent writing is where you write an essay on a given topic using just your experience and knowledge. Integrated writing presents you with some information that you then need to discuss or debate in writing—like the integrated speaking section! It’s fairly easy to make a writing practice test, though, because all you need are a few topics to write about… and then you just write! Start by choosing several topics to write your essays about. For the integrated writing part, academic passages or lecture excerpts are a good place to start. After choosing your two topics—one for the independent writing and one for the integrated writing—you’ll need to write both in 50 minutes, just like during the actual exam. Time yourself when writing. Make sure you don’t take longer than 50 minutes to finish both essays. When practicing, it’s important to remember that a longer essay is not automatically a better essay. Short essays with better sentence structure, clearer vocabulary and better grammar receive higher scores than long essays with hard-to-read sentences and poor spelling. This is the TOEFL test section that asks you to demonstrate your grammar knowledge, so a big part of practicing the writing section is also studying grammar. If you have the opportunity, ask a friend who is a good English speaker (preferably a native speaker) to look at your essays after you write them. This will give you a new perspective on what works and what doesn’t. If you don’t know anyone personally, try this site, Lang-8, where native speakers correct your writing. Don’t get upset if your friend finds lots of errors. It’s better to make mistakes now—in the practice test—and learn from them. Plus, remember that the goal is to demonstrate the effectiveness of your written skills; test graders are not looking for perfection, just clarity. 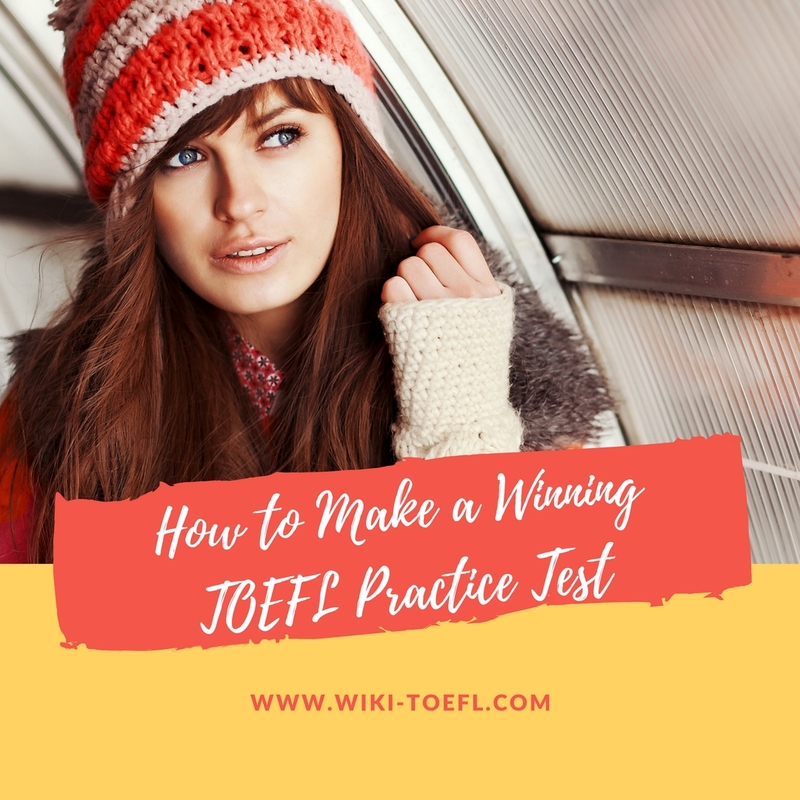 Now that you’ve created all your TOEFL practice sections, it’s time to put them all together for one epic practice test! Definitely try and simulate (copy) the actual test environment. This means doing all of the sections in the correct order, following the time limits and taking the 10-minute break in the middle. Remember that the time you spent creating your TOEFL practice test is all solid English practice, too—which will really help boost your score. So once you get through it all, you will feel very well prepared. Good luck!